The Storm's Cameron Munster celebrates after kicking the winning field goal at AAMI Park on Friday night. WHEN Melbourne winger Josh Addo-Carr produced a freaky banana kick to set teammate Cheyse Blair up for a game-equalling try at AAMI Park on Friday night it looked like a fluke, and something unrehearsed. But the Storm larrikin has revealed to foxsports.com.au the months of training and specialist coaching that culminated in that split-second match winner. Melbourne was trailing South Sydney by six points as the clock approached full-time in Friday's blockbuster qualifying final. The Storm caught the Bunnies napping and found Addo-Carr on his left wing. He sprinted down the touchline, then managed to execute the kick inside to perfection for Blair to pounce on the grubber and score. 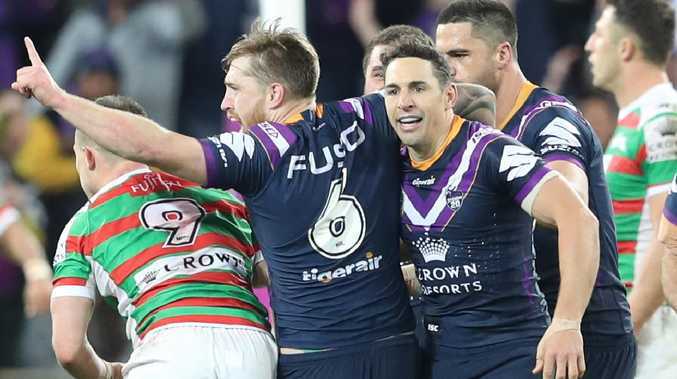 The Cameron Smith conversion levelled the score and then Cameron Munster's field goal sealed a thrilling win for the boys in purple. Addo-Carr said the assist didn't just happen by accident. 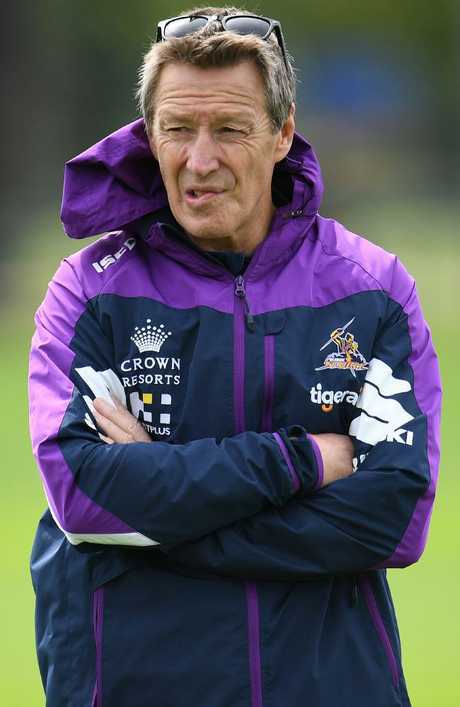 He revealed it all started in the pre-season when Melbourne coach Craig Bellamy sought the help of a rival code to give his team an edge in the NRL. AFL club Richmond offered the services of its reserve-grade coach, Craig McRae, nicknamed Fly, to help the Storm players with their kicking skills. And although wingers wouldn't normally be considered for special kicking classes, Addo-Carr was eager to learn. "I don't know his full name but his nickname is Fly," Addo-Carr told foxsports.com.au post-game. "He's an assistant coach at Richmond. We worked really hard with him in the pre-season to try to get those little things right. "I practise with some of the AFL guys who come and teach us how to kick the ball right. "If those situations come up I have to take them with both hands because it's my job as a winger to do that. "I'm so happy it came off. "I work really hard on that stuff and it was good to get the try assist." For a winger to be able to produce a clutch kick like that, running at full speed and expecting opposition contact, is amazing in itself. But making it all the more impressive is the fact Addo-Carr has to do it backwards - in a sense. Being a right-footer means he naturally wants to kick the ball with his right foot, which is tough when it has to connect with the outside of his boot to go in the direction he intends. "Because I'm a right-footer and I play on the left side of the field I've been practising kicking with my left foot," Addo-Carr said. "I've been working pretty hard to kick it properly and get the balance to put it in the position I want it." The emotion of Friday's thrilling victory was evident in Addo-Carr's interview after the game. The Origin star admitted it was one of the most gruelling contests he had experienced. He struggled to put the feeling into words. "It was an unbelievable game," he said.